The holiday season can be an overwhelming time of year. Starting in October we are inundated with candy and pumpkins from every direction. Then there is Thanksgiving, though it has almost entirely been taken over by Christmas decorations and all things green and red. But traditionally during Thanksgiving, we have family gatherings and wonderful home-cooked meals with desserts made of all things pumpkin. And the day after (or night of) Thanksgiving then gives way to full on Christmas time. We begin to hear the songs on the radio, see the specials on TV, decorate our homes, churches and offices with garlands and trees. And then we start planning parties and family gatherings and throw shopping in the mix and baking treats and no wonder we are exhausted until the New Year! I'm not saying that any of these things are bad. But when you focus solely on the "things" of the holidays you truly miss out on the joy. Even "trying" to focus on the meaning of the season, leaves people overwhelmed with activities and church outings. (And before you get up in arms about that statement, keep reading, I explain). Instead of trying so hard to fit everything in this year, maybe we should just let some things go. Instead of making sure the house is perfectly decorated with every bell, ornament, wreath and tree maybe we can use that time to spend with family letting them help. They may not decorate the way you would like, but spending time with them making memories is much more important than the ornaments being exactly spaced around the tree. Instead of focusing so hard on making sure everyone is saying Merry Christmas instead of Happy Holidays that you jump down their throats for it, just agree and share why Christmas truly is the happiest of holidays because of the perfect gift that was given to the world that night. Instead of stressing out about cleaning your house and planning the perfect parties and gatherings, just be present. Laugh with your friends and family, make memories that last. Because an un-perfectly clean house is not a memory that sticks like the ones shared around the table with those you love. Instead of spending hours upon hours baking by yourself, teach your kids, or invite some of the kids/teens from church or your neighborhood who may not get the opportunity to bake with parents. Sure you have to take time to explain, but you are creating a precious memory for that other person that is worth more than a perfect batch of cookies- and they are learning a life skill! Instead of complaining about all the "Angel Trees" and bell ringers and charities this year, why not cut your family's gift budget to each other and bless some folks in need. Not only will your family not miss the "things" they didn't get, but they will receive a bigger blessing in learning how to serve others. Instead of trying so hard to keep Christ in Christmas, just keep Christ where he should already be- and that's the center of your life. If Christ is your focus for the rest of the year, that shouldn't change during one month. If we have quiet times, and family devotions, go to church, give, worship, and truly live for Jesus all the time, as we are called to as Christians, then there won't be a struggle to "fit" Christ into our Christmas, he'll already be there. 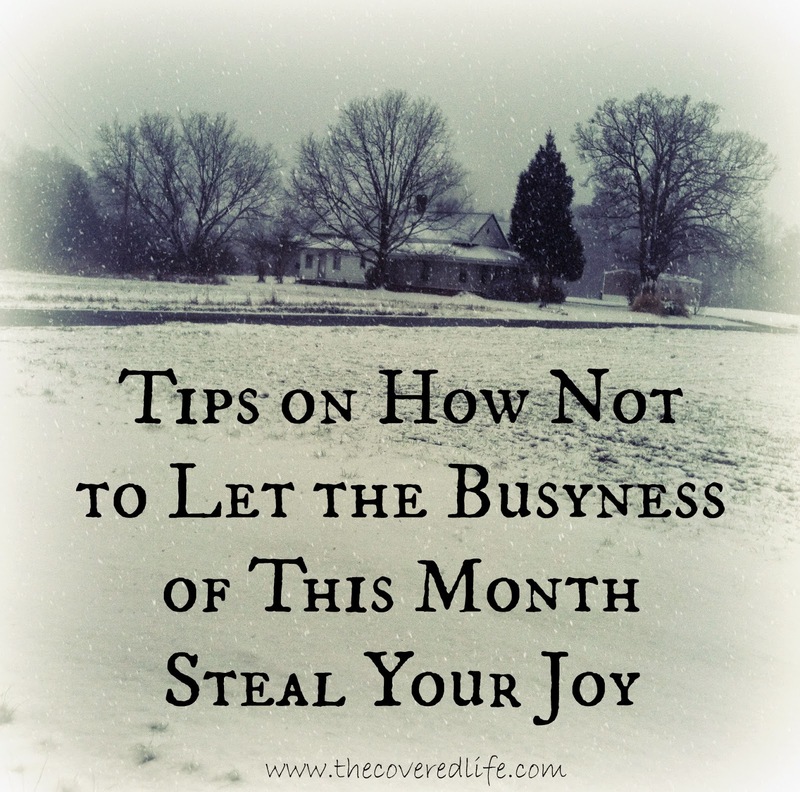 Are there other things you can think about letting go of this month so that you don't lose your joy? Please share them in the comments, I'd love to hear them!